The Best Western Hotel Villafranca is a 3-star hotel set in a 7-storey building renovated in 2005. Different kinds of beauty and wellness treatments, such reflexology, Ayurvedic massage, holistic massage, Shiatsu, abdomen massage and many other procedures are just what you need after a tiresome day of city touring. All of them can be booked right from the room. By request staff can arrange transportation to or from the Airport. There are 94 cozy rooms, placed on 7 floors among which 2 are wheel-chair accessible. Design is simple, but elegant and warm. You find fireplaces, air-conditioners, satellite TV, mini-bars and safes. Dial up internet is surcharge. Bathrooms have either a bath or a shower and complimentary toiletries. Some rooms ar provided with a balcony, giving a breathtaking view to the historical area of the ancient city. 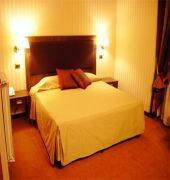 The BEST WESTERN HOTEL VILLAFRANCA is a Tourist hotel. Located in ROME area. Shopping is accessible by bus/taxi and the nightlife/restaurants are located in the hotel. Descriptionclass="small" style="text-align: justify; font-size:11px;">The Best Western Hotel Villafranca is a 3-star hotel set in a 7-storey building renovated in 2005. Different kinds of beauty and wellness treatments, such reflexology, Ayurvedic massage, holistic massage, Shiatsu, abdomen massage and many other procedures are just what you need after a tiresome day of city touring. All of them can be booked right from the room. By request staff can arrange transportation to or from the Airport. There are 94 cozy rooms, placed on 7 floors among which 2 are wheel-chair accessible. Design is simple, but elegant and warm. You find fireplaces, air-conditioners, satellite TV, mini-bars and safes. Dial up internet is surcharge. Bathrooms have either a bath or a shower and complimentary toiletries. Some rooms ar provided with a balcony, giving a breathtaking view to the historical area of the ancient city. Although this place is far from areas of touring you can take taxis or subway. Extremely comfortable and helpful staff. Rooms are very nice and a great place to rest after a fulls day of walking and touring the city. Breakfast buffet is same as all other places and a large selections for everyone. Would stay here again. Expect rooms to be small as it is just the way in most places but enough room to maneuver. we are really grateful for your review on tripadvisor, thanks a lot. We look forward to welcoming you again soon in Hotel Villafranca. My husband and I stayed here for our anniversary trip. We got the hotel through a groupon package and were very pleased with the accommodations. 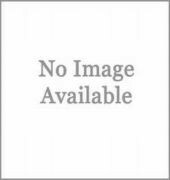 Close to restaurants, walking to the metro and bus station. Our room was spacious for the two of us. Very clean. Breakfast was served every morning and it had plenty of variety. We were able to get buses to our excursions right at the door step. You couldnâ€™t ask for anything more. It was great for our time away! An excellent choice for accommodations when visiting Rome. Nicely appointed rooms with plenty of space. 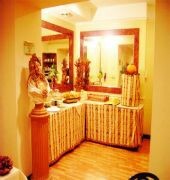 Walking distance from train station & just around the corner from a Metro station. Save lots of money by using subway or buses, taxis are unnecessary. Multiple local restaurants within a block or two & a great grocery store (PAM) just one street away with inexpensive beer, wine & much more. Very pleased with this small,low key hotel -very basic-no clocks in room-no luxury bathroom items-a bit musty and old-BUT,the staff was extremely,kind and attentive-when extra towels and pillows were requested,they were delivered promptly-location is right near the main train station and easy walking distance of many decent local restaurants-booked through gate 1-extremely affordable ! We have read your review on tripadvisor and we do apologies if our hotel did not fully meet your expectations. 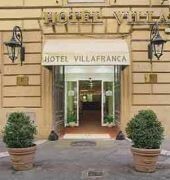 We just returned from a one week stay in Rome and our experience with the Hotel Villafranca was excellent. The priced was reasonable. The hotel's location was very convenient for walking to restaurants, metro stops including the Termini and walking to city sites. It wasn't in a pristine part of the city but it wasn't bad either. We were about a ten minute walk from the Termini station which connects you with all of Italy. The Castro Pretorio metro station was a 2 minute walk. This is the blue line that takes you straight to the Colosseum (2 or 3 stops away.) The hotel had a nice lobby with a bar and also a sitting area. Our group was able to pick up food and bring it back to eat there. The front desk staff was fantastic. They went above and beyond to be friendly and helpful, especially Serena and Joseph. They always got us where we needed to go safely and when we were trying to call somewhere unsuccessfully they offered to make the call for us and took care of the details for us. The breakfast was really good. They always had scrambled eggs, bacon and sausage in addition to various breads, cereals, meats, cheeses and fruits. When we had a very early train to catch or tour to meet, they provided us with a breakfast box to go. All in all we had a very nice experience at the Hotel Villafranca. I would definitely recommend this hotel.